SQUEE! PALLAS WAS BURSTING WITH excitement. She and the other two dozen mortal students on the Triton Junior High cheer and swordplay team were in a flying chariot, heading to perform at a shopping mall called the Immortal Marketplace. The IM was located halfway between Earth, where they lived, and Mount Olympus, where godboys and goddessgirls lived. Officially named the Cheer Blades, her team often marched with the school band and did feats such as sword-tossing, sword-wielding, and battle arts exhibitions at TJH athletic events. But it was a special honor to have been invited to do a choreographed routine for immortals at the IM today! Pallas loved performing. And since it was Saturday morning, there would probably be lots of shoppers around to watch them. But there was also another reason she could hardly wait to get to the marketplace. She’d invited her BFF—the goddessgirl Athena—to come watch the show. Would Athena come, though? She hadn’t answered Pallas’s invitation. Or the last five letterscrolls Pallas had sent before the invitation. Up until these last letterscrolls, Athena had been replying to any letters Pallas sent. But then for some reason Athena had begun ignoring her. Which kind of hurt her feelings. In her letters Pallas had tried not to sound lonely and sad about how much she missed Athena, and she had tried not to put any pressure on her BFF to come to today’s performance. Instead, Pallas had written in an upbeat tone about funny things that had happened at school and about how much fun she’d been having. But still no reply from Athena. “Nice sword,” a snarky voice suddenly piped up. Startled, Pallas brushed away a windblown strand of her long, purple-streaked black hair to see that another team’s chariot had moved closer and was flying alongside the Cheer Blades’ chariot now. And a mortal girl passenger inside it was eyeing Pallas’s sword critically. Farther off there were three other flying chariots as well, each containing mortal students from various Earth schools. All in all, five teams would be performing at the IM today. Pallas’s attention snapped over to the snarky girl’s friend, who added, “Yeah, reeeal nice.” The two unknown girls giggled. They were sitting together, craning their necks to view Pallas’s sword. Unsure what to reply, she scooted the sword behind her leg so that it was less visible. She knew they were just being mean because her sword was not at all nice. In fact, it was downright ugly. Made of iron (which was surprisingly soft unless mixed with stronger metals), it had tons of little dents and rusted patches along the blade. And it was tremendously old, too—as old as her dad! It had been his sword when he was a boy, and he treasured it. He’d given it to her when she’d joined the cheer and swordplay team at Triton Junior High. She had taken it because . . . well, what choice did she have? She needed a sword to be on the team, plus she hadn’t wanted to seem ungrateful or hurt his feelings. Besides, their family didn’t have the money to buy a flashy brand-new sword. Pallas had been babysitting for various neighbors in Triton lately, though, and had been saving her earnings from those jobs. It was fun taking care of little kids, but she was a long way from having saved enough drachmas to buy a new sword. So in the meantime she was stuck with this ugly, old-fashioned, embarrassing one. Embarrassment had made her angry, and she’d meant to put the two girls in their place. However, the minute the words slipped out, she wished she could call them back. Students in both chariots who’d heard her boast went quiet, perking up at the mention of the mega-famous goddessgirl Athena. That included the girl Pallas was sharing a seat with—her favorite mortal friend from TJH, Eurynome. “You’re friends with Athena?” asked the snarky girl from the other chariot. Only now she sounded awestruck instead of critical. “Will she be at the IM today? Can you help us meet her? And get her autograph?” the snarky girl’s friend asked eagerly. “Maybe,” Pallas replied, though she wasn’t really sure about all that. Still are, Pallas wanted to say. But something stopped her. A feeling of uncertainty. She and Athena had grown up together like sisters in the same house on the banks of the Triton River. They’d attended TJH together until Athena had been invited . . . ordered, really . . . to attend Mount Olympus Academy. Would Athena show up at the IM for the performance today? Or was she trying to send Pallas a message by not replying to her invitation—a message that she didn’t want to be friends anymore? Pallas’s stomach tightened. Pallas shrugged. She didn’t want to be this mean girl’s pal! No way. “Mm-hm.” As Pallas nodded in agreement, the snarky girl’s chariot veered away, out of talking range. Discussion over. Phew! “Talk about pushy, huh?” Eurynome said to Pallas, rolling her eyes. Pallas nodded, rolling her eyes too. Then they grinned at each other. Eurynome had only started at TJH one month before Athena had moved away. After Athena was gone Pallas and Eurynome had both tried out for and made the Cheer Blades team. That had led to hanging out and practicing sword drills together, like Pallas and Athena had done before Athena had left. Pallas was a little worried Eurynome was starting to think they were becoming BFFs. Which wasn’t the case. Eurynome was fun, but still, their friendship was not the same as Pallas’s friendship with Athena. Back when Athena had lived in Triton and gone to TJH, she and Pallas had laughed at all the same jokes and shared many of the same interests. They’d been so attuned to each other that they could even finish each other’s sentences! The truth was that Pallas couldn’t commit to being BFFs with anyone from Triton. Because she already had a BFF—Athena! At least she hoped that was still true. “Think Zeus will be at the IM today?” she heard a girl at the front of the chariot ask their coach. Humph! Sometimes when she was feeling especially lonely, Pallas almost wished Zeus had not found time to “get involved” in her and Athena’s lives. Or at least in Athena’s. Because of him, Athena hadn’t been around to hang out with her ever since Doom Day. That was what Pallas had mentally nicknamed the fateful day earlier in the school year when a scroll from Zeus had suddenly dropped its newsbomb on them. Turned out Zeus was Athena’s dad! And his other big news had been that she was a goddessgirl! Both things had come as a whopping surprise. Not only that, but he had commanded that she change schools and start at Mount Olympus Academy right away. Zeus was also the King of the Gods, Ruler of the Heavens, and the principal of the Academy. Therefore, even though Athena had been unsure about going, she had obeyed his orders. The very next day a chariot much like the one the Cheer Blades rode in now, only smaller, had whisked her away to MOA. Athena had not been back to Triton since. After performing it now, the entire cheer team erupted in hoots and whoops. Pallas acted all casual like she always did when asked this question. Ever since the single time when Athena had summoned her to spend the night at MOA, she had been questioned about the details of her visit so often that she had memorized her response by heart. Pallas nodded, feeling like an actor repeating lines. “Oh, yeah. The main cafeteria lady has eight arms,” she added on cue. “Did you get to taste any ambrosia or nectar?” another girl across the aisle asked her excitedly. “Obviously not, or her skin would be glittery,” replied the girl who’d asked about MOA. A third TJH girl two rows ahead replied, “Hello? Did you fail Immortal Studies or something? Eating and drinking that stuff wouldn’t make her skin look glittery. It only affects immortals that way. See? Like those goddessgirls.” She leaned over the side of the chariot to point out a group of four immortals flying in the distance. Everyone, including Pallas, whipped around to look. Her BFF didn’t respond. She must be too far away to hear, Pallas decided. Maybe when they drew closer, she could try to get Athena’s attention again. “Who are the other three? I can’t see them very well,” a girl seated behind Pallas wondered. The students from Triton Junior High got all excited. Acting starstruck, they rushed to the side of the chariot and waved and yelled greetings to the immortals. Hearing them at last, the four goddessgirls waved back. Everyone was making too much noise for Pallas to catch Athena’s attention, though. Suddenly their chariot tipped dangerously to one side. Ye gods! With everyone rushing across the aisle to wave from Pallas’s side, the chariot had gotten unbalanced. “Take your seats!” hollered their coach, who was driving. Quickly the mortal girls took their proper places, and the chariot righted itself. Their flying chariot was part of a fleet whose magic worked for mortals as well as immortals. Zeus had begun lending them out to encourage mortals to visit the IM more often to shop. Luckily, they hadn’t wrecked it just now! But by the time Pallas located the four goddessgirls again, they were barely within sight, continuing on in the direction of the IM. Sigh. She’d missed her chance. Still, she was excited to have spotted Athena. Her BFF must’ve taken Pallas up on her invitation to this event after all. She was coming to the performance. At long last they’d get to hang out like in the good old days. Fifteen minutes later the Cheer Blades’ chariot landed outside the IM along with the other four mortal teams’ chariots. Pallas’s team piled out. Directed by their coach, they marched with their swords at their sides, moving single file into the marketplace. “Wow, there are tons of people here!” said Eurynome, sounding excited and a little nervous. “I guess Zeus’s plan is working,” said Pallas. According to an article they’d read in the Greekly Weekly News recently, shoppers had been avoiding the IM after a blowhard monster named Typhon had terrorized Greece and then attacked Mount Olympus. To make mortals feel welcome at the IM again, Zeus had begun providing free chariot transportation from Earth. He had also been inviting in entertainment like the Cheer Blades to help boost traffic and bring in business for the shopkeepers. Pallas moved her head this way and that, hoping to spot Athena again. There she was, standing across the atrium, in the crowd near a large central fountain. Till now Pallas had been feeling kind of mad at Athena for not replying to any of her recent letterscrolls. But upon seeing her again, memories of their friendship flooded back, and Pallas was dying to go over and say hi and hug her. Unfortunately, her coach wouldn’t be happy if she broke formation or shouted out. Pallas kept her eyes on Athena, willing her to look over. To her disappointment her BFF seemed oblivious to her presence. She and her goddessgirl friends were now talking to some boys. Boys? She and Athena hadn’t been much interested in them back when Athena had lived in Triton. The two of them had kind of been outsiders. Mostly because of what Athena had called her own “weirdness.” Pallas hadn’t minded, though. No matter what anyone else had thought, she’d known her BFF was mega-cool. Because even back then Athena had been supersmart and exceptional in many ways. She had learned to knit and do math when she was only three years old. And in elementary school she had invented the flute and the trumpet, and had played an impromptu concert, even though she’d known nothing about music. And then there was the time when Athena’s feet had left the ground and her hair had turned into bristly brown owl feathers. Right in the middle of gym class! Although she had changed back almost immediately, some kids had nicknamed her “Birdbrain” as a result. They’d stopped all their teasing when it had turned out that the “weirdness” was an indication that Athena was in fact a goddessgirl. “Students, be seated!” At their coach’s signal, Pallas and the rest of her team took their assigned seats in chairs that had been set up around a temporary elevated stage in the wide aisle between the shops. Along with the other teams, they awaited their turn to perform. The Cheer Blades were scheduled last, so they watched the other groups do their routines first. Pallas kept turning her head, trying to catch Athena’s eye, but Athena was still off in the thick of the audience and too far away to notice her. 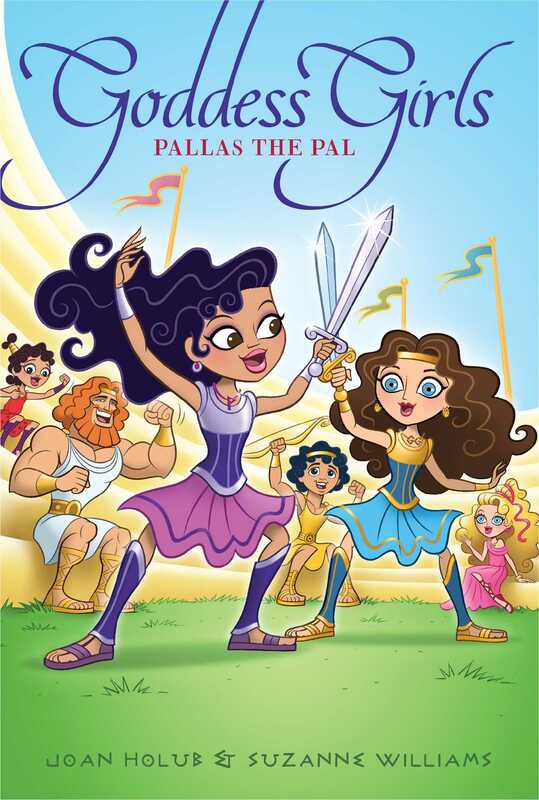 Since the Cheer Blades were wearing their newly redesigned purple uniforms trimmed in white, Pallas realized Athena might not recognize them as being from TJH. Plus, Pallas’s dark, wavy hair looked different with the matching purple streaks she’d added especially for this occasion. Surely once they got onstage, Athena would recognize her, though. As the third team performed, Pallas bounced in her seat, feeling a bit antsy to get onstage. Would Athena be impressed by the skills Pallas had acquired since they had last practiced together? To be sure, her dad’s banged-up old sword wasn’t very impressive, but Athena wasn’t stuck-up. She’d seen that sword many times back when she and Pallas had shared a bedroom in Triton. And she’d never once made fun of it. Finally it was the TJH team’s turn. They marched onstage and lined up in formation. As one of the best members of the team, Pallas took her place front and center. Athena couldn’t miss her now! The music began, and the Cheer Blades unsheathed and brandished their swords in a carefully orchestrated routine they’d practiced a gazillion times. Pallas put out her best effort, kind of showing off a little. During a pause in the routine, Pallas scanned the crowd. Where was Athena? She wasn’t standing where she’d been before. Had she moved, or . . . left? Her attention diverted, Pallas was a few seconds late with the next move. Trying to catch up, she swung her sword a bit too hard. Clank! Its iron blade hit her teammate’s newer, stronger steel blade in the wrong way. With a sad creak, the sword Pallas held twisted in the middle and bent sideways. Oh no! It was now impossibly mangled—right in the middle of the most important routine her team had ever performed!